I’ve been accumulating more and more tea accessories over the last few months. I guess that’s what happens when you start a tea blog — am-I-right??! It seemed a shame to only enjoy these things myself. It was time to share the tea love. Time to share the warm and cozy magic of the tea cup. Dammit — it was tea party time! Who doesn’t love a tea party??! Sitting around eating adorable food and drinking tea all day? Sounds like a #win to me. I knew I wanted to throw a tea party but I also knew it needed to be a modern, adult tea party. 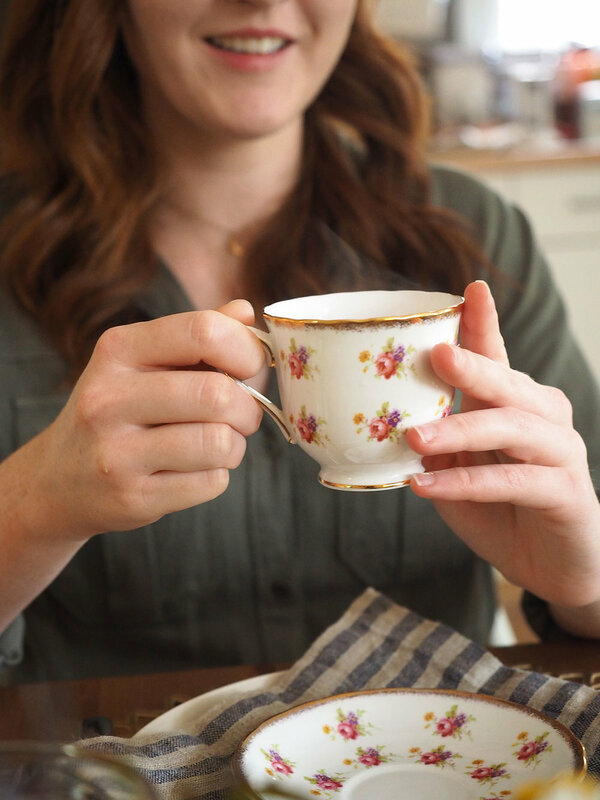 No tiaras, no frilly dresses, no fussy rules or restrictions about who can pour tea. Anyhow, I wanted to throw a tea party with good food, good friends, good conversation and good tea. A mismatched party seemed like just the thing since I had been acquiring such a hodge podge of tea goodies. Plus, does anyone have a matching tea set these days? I don’t think so. So if you’re thinking about hosting a tea party, I suggest you embrace the modern mismatched tea party theme — ditch the rules, ditch the lace. Let’s all make this easier on ourselves and just throw a fun, modern tea party we would actually want to attend. And if you’re not sure where to start, don’t worry, I’ve got your back. I’ll show you how to host a modern, mismatched tea party focusing on all of the fun and delicious parts and none of the stuffy annoying rules. Let’s get started. 1. Gather your matched and mismatched supplies. Alright. This is a mismatched tea party, which means you’ll need some mismatched supplies to pull it off. Even though this is a mismatched tea party we don’t want the decor to feel completely random. We’re going for the mismatched-yet-✨magically✨-still-cohesive look. Choose 2 of the categories above to find mismatched items for. For my tea party, I chose “Teacups, saucers and teapot” and “Cloth napkins”. For these categories, I knew I would find mismatched items. Even though you’re looking for mismatched items, try to find items that are approximately the same size and possibly in a similar color palette. Choose 2 of the categories above to find items that match one another. I chose “Plates” and “Placemats”. I already had a set of white plates and a set of matching gold placemats. To make the table look cohesive we need to make sure there is enough similarity between each place setting. By choosing 1 or 2 aspects that are always the same, we create that common thread. If there’s one thing you’ll need at a tea party, it’s tea. For your tea party, you would ideally want to have 2-4 larger teapots on the table each with a different tea so that guests can taste a variety of teas throughout the event. If you don’t have access to larger teapots, you can also provide individual tea bags so that guests can pick their own tea to brew in their teacups. For a classic tea party choose Lord Bergamot by Smith Teamakers. It’s a sophisticated black tea, richer and more interesting than most. For a similar grocery store option, try Earl Grey. For a whimsical tea party choose Roasted Almond by Teahaus Ann Arbor. It brews pink and tastes like Christmas in Hawaii — seriously. For a similar grocery store option try Nutty Almond Cream Tea by Tiesta Tea. For a calm and peaceful tea party choose Lavender Sunset by Townshend’s Tea. Lavender, sage, lemon verbena… it’s completely calming. For a similar grocery store option, try chamomile. For an exotic tea party choose Fez Green Tea by Smith Teamakers. It’s a minty green tea that Smith Teamakers describe as “best when shared with friends while lounging on pillows”. For a similar grocery store option, look for a Moroccan Mint tea. For a cozy, fireplace-friendly tea party choose Alpine Punch by David's Tea. It’s a rooibos tea with apple, cinnamon, almond and coconut. Would be hard to find a grocery store equivalent. Don’t forget the sugar, whole milk and lemon wedges on the table! 3. Consider serving a tea cocktail! Just because this is a tea party doesn’t mean there can’t also be booze (hello champagne). In addition to the traditional teacups and teapot, you might want to throw a coupe glass in there. There are endless options for tea party food but the general concept is small and cute. And please, don’t just revert to cucumber sandwiches if you hate cucumber sandwiches. Choose food you like but just cut it small — ta da! It’s tea party food! Try to serve a couple savory items and a couple sweet items. Even though we think of desserts at a tea party, no one wants to go home in a sugar coma. For my savory dishes, I served tomato soup with a variety of ricotta crostinis: 1) Blood Orange olive oil & lemon zest, 2) Sauteed leek with thyme and bacon, 3) Honey and pistachio, 4) Pear and walnut with nutmeg and maple syrup. For my sweet dishes, I served my Earl Grey Cardamom Cookies, Matcha Dipped Madeleines, and Lavender Walnut Scones. Oh! And raspberries. Everyone loves raspberries. 5. Make the setting beautiful. A beautifully set table is a must for any tea party. Your tableware will do much of the work but remember the centerpiece and name tags to round out the decorations. Assuming your tea party is just for fun with no set purpose (ie. bridal shower, baby shower...), use the season to help determine your decorations. Decorate with small pumpkins or leaves in fall. Create a winter wonderland with blue and white candles in winter. Go crazy with the flowers in spring. Keep decorations bright, colorful and loud in the summer. No matter what you use for your centerpiece, keep them low low low. You aren’t creating a centerpiece that is going to be removed just before dinner. You want something low so that your guests can easily see each other... and also so they can tell which yummy treats are just out of reach. Have any other great suggestions for how to throw a modern mismatched tea party that I should try for next time? Let me know in the comments below!